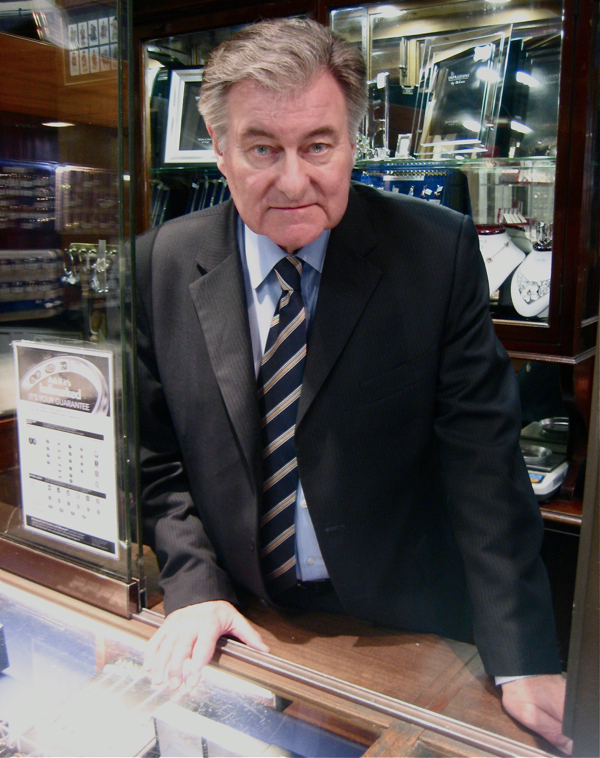 This dapper gentleman in the elegantly understated suit and tie, with the immaculately combed silver hair and naturally distinguished features is Bryan Edwards, who in 1985 acquired Attenborough Jewellers in the Bethnal Green Rd – the largest East End Pawnbroker, established in 1892. You might assume Attenborough’s was the last vestige of a former world of poverty – even a relic of another time – but you would be completely wrong because pawnbroking is a growth industry that is booming in the current financial climate, with each recession providing further opportunity for growth. Whereas once the pawnbroker served only the poor, now members of all social groups find their way into Bryan’s modern pawnshop with its smart leather couch and air of being an upmarket bureau de change. “We’ve had a lot of people from the City in here,” confided Bryan proudly to me as I enjoyed a tour of his splendid facilities, without any trace of the dinginess that is associated with old-school pawnbroking in the popular imagination. “Just after the war, there were only a hundred and forty pawnbrokers left in this country,” revealed Bryan – a former President and member of the Council of the National Pawnbrokers’ Association for twenty-seven years – widening his eyes in concern at the thought of those dark days. “We operated under a lot of financial restrictions until 1985 when the Consumer Credit Act of 1974 became law, and that gave us more scope. And now there are over twelve hundred pawnbrokers nationwide,” he continued, with a modest grin of satisfaction at the collective tenacity and prudence of those fellow members of his own industry who have proved themselves survivors through the thick and thin of the post-war years. “We’ve seen some changes!” he declared with the understated swagger of an old trouper. “In 1985, the limit on lending went from fifty pounds to fifteen thousand in twenty-four hours,” he recalled, his eyes gleaming in retrospective delight, “And when the recession of the nineteen nineties kicked in, that was when it really began to grow and expand. We had people who couldn’t pay their mortgages and City executives coming in.” Adding for effect, “We kept calling up the bank and asking them to send over more money!” he said, to convey the sense of carnival at this glorious moment in the history of pawnbroking. 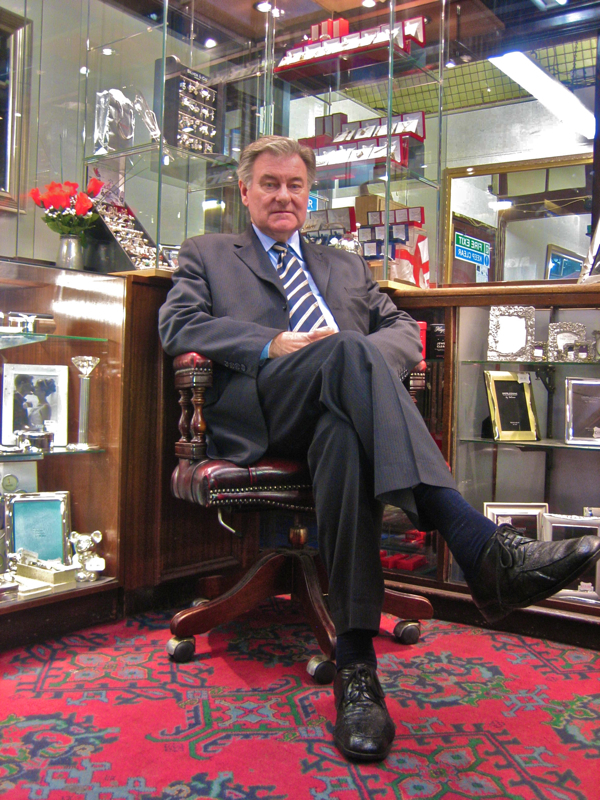 Bryan’s father started the family business as a jeweller in King’s Cross in 1944 and ran it until an unexpected illness in 1958. “In three years, I had to take over and run the business. I was thrown in at the deep end.” Bryan explained to me, introducing the account of his entire lifetime in the profession in which he has proved such an outstanding success. 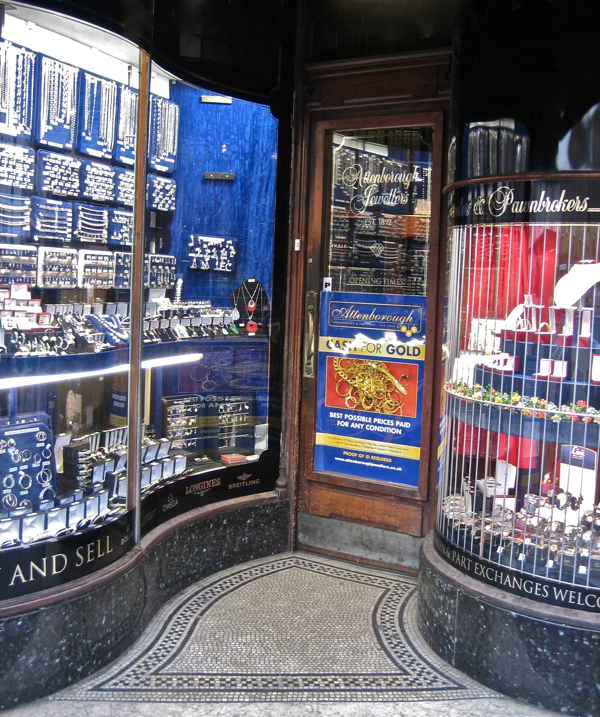 Counterbalancing Bryan’s modern pawnshop entered by the door on the right hand side of Attenborough’s, is the traditional jeweller’s entered through by the door on the left hand side. Approximately fifteen per cent of the items brought in through the right hand door as security for loans get sold through the left hand door when their owners default on their debt, Bryan told me. The average loan is between five and and fifteen thousand pounds, with jewellery as the most common form of security and approximately five months as the average pledge, I learnt. “Some people are just not capable of managing their finances. They don’t budget and they overspend.” Bryan admitted reluctantly with a frown of disappointment, as if he felt personally let down. “But we do everything we can not to foreclose because it’s not in our interest to sell a customer’s goods since we lose a customer. Because we are a family business, we always help out if people are in difficulties and we bend over backwards to help those who are in real need.” he said, clasping his hands in concern and speaking more like an altruist than a businessman. His bold confidence reflecting the fact that the banking crisis and consequent dearth of credit and loans has been good news for the pawnbroking industry, enabling Bryan to expand his operations further – manifest in his sleek refitted pawn shop. “Our role is where the banks didn’t help. It’s like instant coffee, it’s instant money!” he enthused with a chuckle, spontaneously coining a slogan in his eagerness to give money away to people. Bryan led me up an old staircase through a sequence of small matchboarded rooms to arrive at the office up above the shop, with a magnificent nineteenth century fireplace, shuttered sash windows and views up and down the Bethnal Green Rd. Here Bryan gave me his account of himself while his daughter sorted through filing, occasionally interjecting, “Just between ourselves” and “Don’t tell anyone this but…” into his monologue, much to her disapproval. I found it remarkable that he had retained such a trusting nature after more than half a century as a pawnbroker. 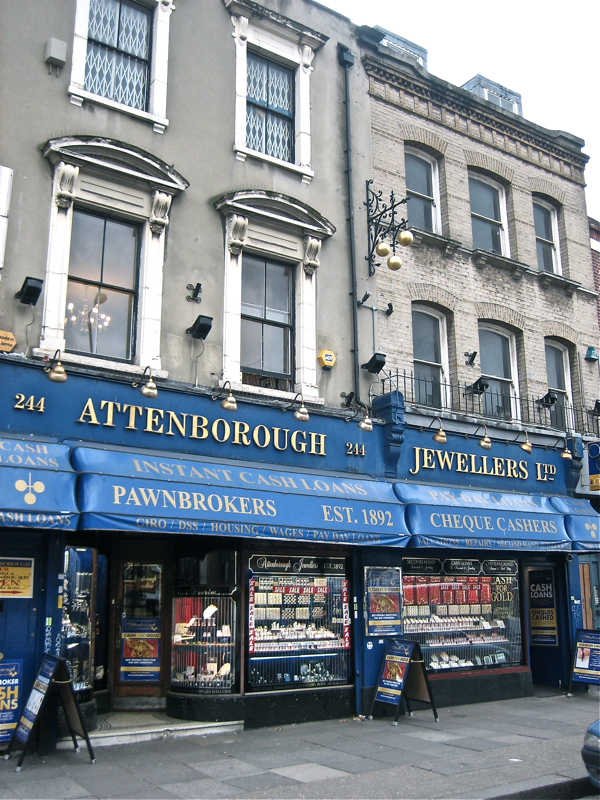 As someone who was born in Boreham Street, just off Brick Lane, in 1923 I can well remember Attenboro’s shop in Bethnal Green Road. My family were in the clothing trade and often went through hard times during the “slack season”. When things were really tough, my dear late mother used to send me with one of my father’s suits to raise a few shillings until some cash came in and by the same token I was sent to redeem the same article when things were “easier”. The redeemed suit would have been wrapped in blue tissue paper that immediately told the neighbours that one had been to the pawn shop but I was always told by my mother to pay an extra penny for plain brown paper so as not to give the game away ! I find that an amazing statistic. Mr Edwards seems to be a very sympathetic man. It’s many years since we knew each other Bryan and you are looking very well. In fact you don’t look much different than 50 years ago. I worked at attenborugh’s many years ago and I always found Bryan Edwards to be a very nice man to work with,very kind,with a great sense of humour.It was so nice to read this article.